If you've already cheated on your diet and broken your pact to go to the gym each morning, don't fret. I have a resolution you can actually stick to. Here's a perfect excuse to take a good look at your pantry and ditch any "bad" foods—whether they've gone bad, or they're bad for you. All you need is a few hours, a garbage can, and a trip to the store. Spices don't go bad, per se, but they will let you down in the flavor department. And really, do you remember when you bought that curry powder or five-spice blend? According to McCormick, the spice people, here's when to ditch that bottle. And if you still have tins with spices in them, they're well past their prime. Newer spices now have expiration dates printed on them, so read the fine print, and if your bottles are past date, or if you remember buying them for a dinner party two houses ago, it's time to replace them. 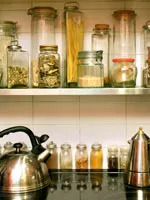 Next to or above the stove may seem like the perfect place to store your spices, but it exposes them to heat, which will make them age faster. Store your spices with the caps on at room temperature, away from windows, heat, and moisture. If the color has faded, it's time to throw out the spice. Spices should be vibrant in color. Paprika, chili powder, and chili flakes can be stored in the fridge to keep them fresher longer. Your biggest pantry investments are oils and vinegars. Oils are delicate because the fatty acids in them are prone to becoming rancid. Keep them away from heat and light—that means not right next to the stove. And if you buy it in a big bottle, it's best to transfer a smaller amount to a tinted glass container or a stainless steel decanter. If you store olive and other oils properly, they should last for up to a year. Vinegar is much more resilient because it doesn't contain any fat. It will last indefinitely, as long as you've stored it with the cap on tightly. Certain vinegars will discolor over time, but that shouldn't affect the flavor. Canned and dried beans, dried pasta, and rice all last a long time, but not indefinitely. There should be a "use by" date on the package, so make sure to cook the product before then. The real issue with these dried products is that once you open the package, they become prone to critters. Eww! That's why I keep all my pantry staples in glass jars or canisters with tightly fitting lids. The same goes for flour, sugar, and pancake and waffle mix. Brown rice and other whole grains won't last as long as refined grains, so if you have the refrigerator real estate, it's a good idea to store whole grains in cool temperatures. I know it's a pain to climb up and dig through those shelves (believe me, I'm over seven months pregnant), but it's less fun to start a recipe only to discover that your olive oil tastes bitter, your pasta has been attacked by weevils, or your chili powder doesn't have enough kick. Do one big purge this month, and you won't have to think about it again till spring. Happy cleaning!